Yacht-Log reports from the world of water sports, and combines this with corresponding articles from the fields of tourism and lifestyle. The chief editor of the magazine itself is an experienced skipper, longtime travel journalist and author of several guide books on worldwide destinations. Well-written stories, beautiful photographs and an exciting layout take the reader into the stunning world of water sports in all its aspects. 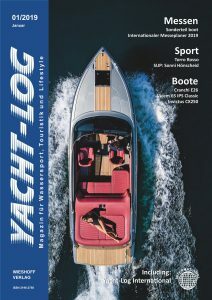 The magazine includes „Yacht-Log International“, an English appendix with international news for our readers in Europe and the US. Are you interested in advertising? Please find our media facts here. Urheberrecht © 2019 Yacht-Log Alle Rechte vorbehalten.